One button click creates an assignment topic where you can discuss details with students. Considering Kyle’s prototypes of a LMS board, I found this awesome jQuery calendar, which I will include in schedules component. This step means we will start using jQuery UI which I was avoiding, but as long as it helps on UI/UX part, I think it doesn’t matter anymore. 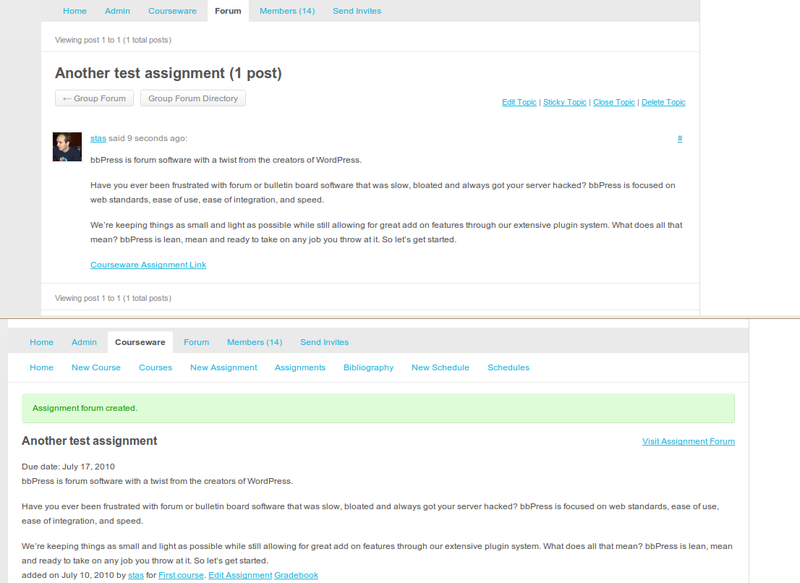 Also the assignments date picker will be exchanged with another jQuery UI plugin: DateTimePicker. Gorgeous! It’s similarity to Google Cal will be much appreciated by content creators/instructors. Glad one of my mockups could serve some inspiration. Looks like exactly what I needed. When I first loaded the plugin, the ‘assignment’ folder was not created, so the plugin wouldn’t activate. I manually created the folder and placed the relevant file in it. The plugin activated successfully, however, when I click on Courseware, no menu appears as in you example above – only the following: HOME_TEMPLATE_LOADED. I got a question, that was the BuddyPress version you were using? Ok, I think I missed something from install how-to page. and try again the whole installation process? I upgraded to 1.2.5, but still have the same problem. I also tried the default theme – same problem. When you go to your profile, then try to edit it inside BuddyPress, do you see any courseware tab there? Once the plugin is active, it should add a new tab with your role as a Student or Teacher. If you are super admin, you should see there all the options, and be able to activate yourself as a teacher. Also, to be sure that the plugin is ready, you should see a Courseware tab in wp-admin left menu, just inside BuddyPress menu. I can see the other “Courseware” tabs too, “Assignments, etc.” But is there supposed to be something besides “HOME_TEMPLATE_LOADED” when I first select the “Courseware” TAB? How close are you to getting “Assignments” listed in the “feed”? Courseware 1st tab will be a dashboard which is planned to be integrated only in July, once all the components like gradebook and schedules are done. About sharing data. None of the components is now sharing data, nor in ActivityStreams, nor by regular feed (and probably that will never happen). Integration with notifications/activitystreams will be finished during UI/UX milestone period when all of the components will be tested for integration. Also, this should probably be “Your role”: “You role when using Courseware.” (in the Courseware tab). Finally, isn’t it possible to be teacher on a course-by-course basis? The good news is that a handbook is coming alone. What about the error, what is the version of Courseware you use? Can you update to the latest? I plan to add it to the apps directory the next week. Sorry, and thanks a lot. WIll be fixed for final release. No problem. It was with the Release Candidate. As for the handbook, that’d be awesome! Not that the system is incredibly difficult, but it does require a few switches in the way we do things. This “teachership application procedure” is a good example of something not entirely obvious but easy to do. So a handbook will be deeply appreciated. In the meantime, I’ll explore more. I plan to use it in parallel with Moodle in my two courses this Fall (starting September 9). I’ll also be discussing at WordCamp and PodCamp before and after the beginning of the semester. Great news, can’t wait to see it in action. I will ask you about feedback, bugs, and features you would like to see coming next. I have installed your plugin but I am not seeing the Coursework in Buddypress. Am I missing something? I followed your install info. I have screenshots of the issues – where can I email them to? These days I had some problems with my nameservers, should be ok soon. Group courseware tab will be dashboard, its scheduled for late July. Working on assignments. 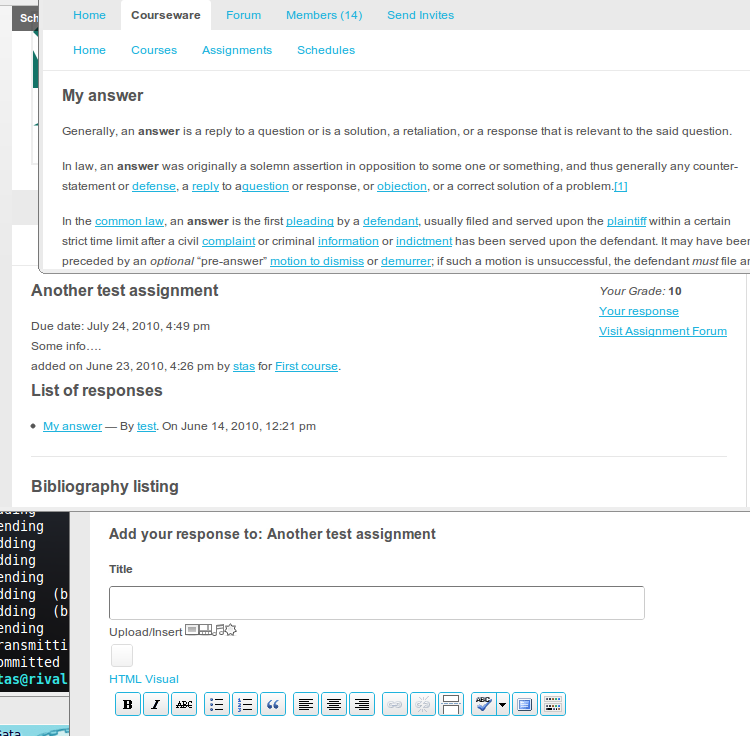 Bibliography will get merged into assignments since there’s no other need of them except assignments page. Most probably Bibliography will become a ‘Resources/Refferences’ tab on assignment page (OCW style, in fact I studied OCW during last days and found it very well designed piece of software, and I’m willing to steal as much as I can from there). Bibliographies will be saved as custom fields along assignment post type. Some feedback would be welcomed, since this is a bit different from what was initially mocked up. Thanks. Looks good. Although, how come you’re going to be using custom fields for bibliographies and assignment types? Wouldn’t custom taxonomies end up being more stable in the long run? More like a shortcode approach. Wouldn’t students want to be informed at the start of a year or trimester what books thet need? So thay can buy or hire them? Here in the Netherlands I think students would like that. Hmm, good point. I’ll see how can we solve that.